Friends rave about how great my homemade bread is - I keep telling them, "It is soooooo easy to do with an EZ DOH!" Love this product! Durable, easy-to-use & clean, too!! Really love making bread with your bucket. Best purchase ever. Thank you. Saw EZ DOH at the Mother Earth News Fair in NC. I bought one and I love it! My kids love it! It works great, I have a vintage metal mixer, almost same design but it's a lot bigger so I couldn't use it for a small batches (like 1 or 2 loaves). I usually make very hydrated mixes for ciabattas that can't be knead on the table. I'm very happy that I found this one. It's all plastic what I don't love, even the hook (I thought that it was going to be metal) but works very good. This is the best thing that I have purchased in a long time. We have done so much baking that my arms are tired of mixing the dough. 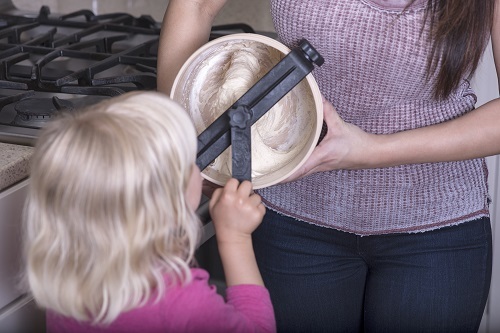 The EZ Doh makes baking a breeze and no more lugging around the old heavy mixer !!!! !